(L-R) DiMaggio and Anderson are believed to be on foot in the Frank Church River of No Return Wilderness in Valley County, Idaho. A reported sighting of a murder suspect and the teenager believed to have been abducted has narrowed a six-state Amber Alert to a rural community in Idaho known as the River of No Return Wilderness. San Diego County Sheriff Bill Gore announced Friday that officials have recovered the vehicle of James Lee DiMaggio and have focused their search near Cascade, Idaho, approximately 80 miles north of Boise and roughly 400 miles from the Canadian border. DiMaggio, 40, of Boulevard and Hannah Anderson, 16, of Lakeside are the subjects of an Amber Alert issued Monday. Hannah and her brother Ethan were originally believed to have been abducted after their mother was found dead in a house fire. On Friday, officials positively identified Ethan as the second victim in that fire. Now, officials say it appears Hannah Anderson may be with DiMaggio willingly. On Wednesday, a horseback rider ran into a man and a teenager near Morehead Lake. The horseback rider had a brief conversation with the two but saw no reason to be alarmed. He told officials they appeared to be hikers or campers, which are common in the area. The man and teenager had backpacks and a tent the rider said. They were spotted twice entering and exiting a campground about six to eight miles from where the vehicle was discovered. When he encountered the suspect and the teenager, the horseback rider was not aware of the Amber Alert. Andrea Dearden, acting Public Information Officer for Valley County, Idaho, said the man contacted the Amber Alert tip line Wednesday evening. That tip was shared Thursday with investigators. Officials discovered the vehicle linked to DiMaggio on Friday covered in brush with the license plates removed about 15 miles northeast of Cascade. Officials were able to identify the vehicle through the VIN number. Authorities believe DiMaggio may have homemade explosives. Sheriff Gore said no explosives have been found in the vehicle so far, however Idaho officials say they have not been able to get inside the car to investigate. Dearden said the car is still in the wilderness area where it has been secured until experts can arrive to attempt to search the interior. A search team of 12 people are on the ground using satellite phones, horses or all-terrain vehicles and helicopters from the Idaho Air National Guard Dearden said. “It is treacherous terrain. It is back country. It is wilderness area,” Dearden said. When asked to describe the search area, Dearden could only estimate it at dozens of miles. Teams have been stationed at multiple access points around the wilderness area to monitor anyone coming or going. Officers with local law enforcement, Idaho State police, the FBI, the U.S. Marshal’s service and U.S. Customs and Border Protection have all joined in the search. Some investigators will be sent from San Diego to assist. Gore was confident Hannah Anderson will be returned safely to San Diego. 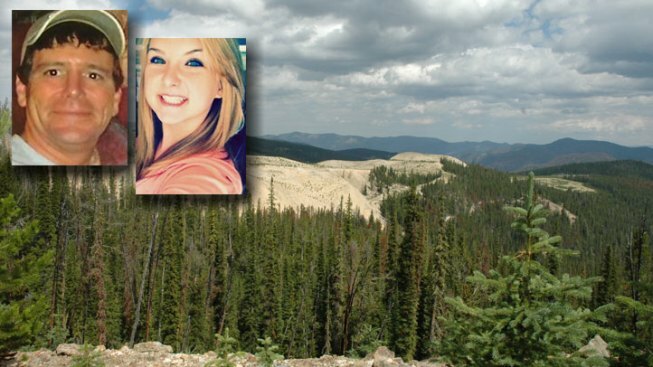 “She was alive on Wednesday and we hope that law enforcement will find them up in the mountains there and return them safely,” said Gore. Gore said as far as they know, Hannah did not look like she was being held against her will. According to Dearden, the horseback rider told officials the conversation with the pair was odd but not alarming. There was nothing done or said to cause him to think he needed to help the teenager. Hannah's younger brother was also listed in the Amber Alert, but DNA tests revealed the boy died along with his mother. The San Diego County Sheriff's Department Friday night confirmed that a second body found in the burned-out home is that of 8-year-old Ethan Anderson. Initially, investigators believed the boy was also traveling with DiMaggio and Hannah. He was described as 4-foot-11, weighing 65-pounds, with sandy blond hair. Before Friday night's confirmation, family members – including the children’s father Brett Anderson – had implied that Ethan was found dead in a house fire with his mother Christina Anderson on Monday. Investigators confirmed a child’s charred body was found inside the burned out home in Boulevard. Due to the condition of the body, Ethan's identity was determined using DNA analysis of his bone marrow, the sheriff's department said. Records have confirmed that Anderson has only two children, Ethan and Hannah. Just as friends and family have been holding vigils and praying for Hannah, they’ve also been praying for Ethan, calling the young boy a great kid with lots of friends who love him. Friends have also said Ethan and Hannah had a strong sibling bond, with little fighting and lots of love between them. As a family, friends say the Andersons were very happy and seemingly had a great relationship. Emergency personnel were called to the 2000-block of Ross Avenue in the unincorporated community of Boulevard east of San Diego around 8 p.m. Sunday for a structure fire. DiMaggio's log cabin-style home and detached 3-car garage were fully engulfed in flames. Firefighters called in sheriff's deputies when they recovered a body on the property. Once crews were able to bring in a bulldozer on Monday, they recovered a second body and several weapons burned in the fire. They also recovered the body of a dog. Officials have not released how Christina Anderson and the unidentified child were killed. They also have not identified a possible motive. Christina's father, Christopher Saincome, said his daughter went to visit DiMaggio's home to say goodbye before he moved to Texas. Hannah Anderson attended El Capitan High School in Lakeside where friends said they believed she was abducted against her will. They described DiMaggio as having a crush on the 16-year-old girl. DiMaggio was close friends with Christina Anderson, her ex-husband Brett Anderson and their children for years. He recently worked at the Scripps Research Institute in La Jolla. Court records show that he filed for divorce in 2003. His ex-wife told an NBC Station in Seattle that she was shocked to learn the news since DiMaggio has been best friends with the family for such a long time. She said he served in the Navy but showed no signs of PTSD during their marriage. Officials say DiMaggio is an experienced outdoorsman with skills to survive in the wild. It's not known what history he may have in the state of Idaho officials said. He purchased camping supplies shortly before allegedly burning the house investigators said. As for a motive behind the murder, arson and kidnapping crime spree, Sheriff Gore said they don't have one just yet. "We all have come up with a theory but really it is speculation and we wont know until we get Hannah and DiMaggio back here for further questions," he said. After five days, FBI agents and local law enforcement agencies expanded the Amber Alert to include, Oregon, Washington, Nevada, Arizona and Idaho.